In this 5th pAsuram, nammAzhwAr identifies the internal hurdle and remedy for approaching bhagavAn. Subsequently, the venerable emperumAn being the most apt goal to be attained is explained by nammAzhwAr. While approaching emperumAn (to be relieved from samsAram), an internal hurdle could arise. nammAzhwAr is mercifully giving a remedy for that as well. One who desires indhra’s position would not care for wealth in this earthly realm. One who desires for brahmA’s position would not care for indhra’s position. One who desires for AthmAnubhavam (enjoying one self in kaivalya mOksham) would not care for any worldly pleasures. One who approaches emperumAn who is filled with most auspicious qualities and having eternal divine forms, will not care for any of the previously mentioned aspects. Thus nammAzhwAr highlights the internal hurdle and its remedy. When attachments towards aspects outside bhagavath vishayam are given up, AthmA is fit to attain (kaivalya) mOksham (being free from samsAram and enjoying oneself). Eradicating such thought of kaivalya mOksham, giving up attachments towards everything else and approaching emperumAn to be firmly situated in him, submit to Iswara. First nammAzhwAr explains the common aspect of being liberated from sufferings and then instructs that one should approach emperumAn to be fully situated in eternal kainkaryam. When giving up attachments towards worldly pleasures, one will see the most shining AthmA (self). Without getting trapped in that, one should approach emperumAn at that stage itself to be fully situated in one’s true nature. uRRathu vIdu uyir – AthmA attained liberation. Pure knowledge and nature of AthmA is hidden from oneself due to attachment towards worldly pleasures. 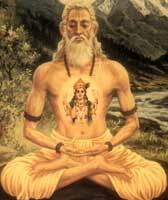 Once such attachment is given up through yOgAbhyAsam (constant practice of ashtAnga yOga), AthmA will shine radiantly. Since that is realized as eternal, fully knowledgable and blissful, one may develop attachment towards enjoying oneself. aRRu iRai paRRE – While approaching him, have full faith him and submit to the supreme master. Its also explained as “iRai paRRi, iththai aRap pAr” (submit to emperumAn and try giving up the attachments to worldly pleasures) as explained in mUnRAm thiruvanthAdhi 14 “mARpAl manam suzhippa mangaiyar thOL kaivittu” (by having our mind focussed on emperumAn, attachment towards worldly attachments will fall out). In the next article we will the next pAsuram. This entry was posted in thiruvAimozhi, thiruvAimozhi 1st centum on May 16, 2015 by Sarathy Thothathri. dear sir, I LIKE THIS THIRVAIMOLI.